The Americans have stepped in to help save her. An American zoo is partnering with an Australian university to save the Tasmanian devil in the wild. San Diego Zoo Global and the University of Sydney are collaborating to assist the endangered marsupial, through the reintroduction and management of a disease-free population. Tasmanian devils have become increasingly threatened in the wild by the spread of a fatal cancer. “These populations will be managed in the best possible way to maintain the genetic diversity of the species,” said Professor Kathy Belov, Faculty of Veterinary Science at the University of Sydney. 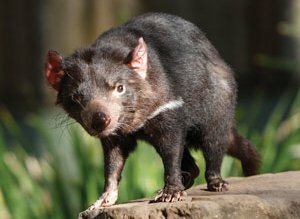 The Tasmanian devil faces extinction in the wild within 25 years because of Devil Facial Tumour Disease which has already wiped out 85 percent of Tasmanian devils since 1996. An important part of the project will be the reintroduction of 50 devils to Maria Island, off the east coast of Tasmania. The group will be carefully managed, much as it would be in a zoo, by selecting disease-free individuals and preserving genetic diversity. “The cancer is spread through physical contact of one Tasmanian devil with another and unfortunately no cure has been discovered,” said Bob Wiese, Chief Life Sciences Officer for San Diego Zoo Global. San Diego Zoo Global is contributing $500,000 to the project including funding the employment of conservation geneticist, Catherine Grueber, at the University.